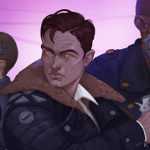 Erik Meyer: Disjunction plops players down in a cyberpunk dystopia, so can you flesh out the history of your specific game universe and the touches you’re adding that give it unique flavor? Exactly how might this 2048 NYC differ from expectations, and what kinds of disruptive technologies dominate the landscape? Erwan LeCun: Basically, Disjunction is a future in which humanity has made every mistake it possibly can. Wealth inequality is sky-high, climate change has wiped out entire cities, poverty and crime have increased dramatically because of poor social safety nets, etc. Our game is cyberpunk, but we’re trying to stay away from a lot of the classic depictions of the genre such as neon-drenched streets, flying cars, and human-level artificial intelligences. We wanted to do more of a believable, near-future setting that feels like it could be right around the corner. Our setting is more like the original Deus Ex, rather than Blade Runner. The most notable kinds of technologies that dominate the world of Disjunction are cybernetic implants and emerging artificial intelligence. Both of these are disrupting American society in the year 2048, and both play a big role in the game’s story. EM: The game’s pixel art graphics bring a mature SEGA feel, so what guides your art asset creation? I notice that enemies turn red when stunned and main characters have a simple outline when entering stealth mode, providing clean, minimalistic solutions; when it comes to visuals representing in-game activities, what constitutes a final version versus a working prototype? EL: For us, clarity is key for things like animations or status effects for enemies. Pixel art is a tricky medium where you really only have so many pixels to work with, so you have to sort of “suggest” more than you can show and leave a lot up to the player’s imagination. To aid with clarity, we tried to keep the UI as simple as possible and to design detailed yet easily readable environments/characters. Disjunction can be a very fast-paced game, so it needs to be very obvious to the player what’s going on in the game at all times. It’s tough to say what constitutes a final version. Usually, we just drop assets in place and make sure they’re up to our standard of quality, both in terms of level of detail and overall fit with the rest of the game’s art. If an asset is deemed to be clear, readable, and cool, then we keep it in. Otherwise, we rework it. EM: We see examples of the upgrades (Deadeye, First Aid, Electroshock Module, Smoke Grenade) and talents (relating to Fitness, Infiltration, Marksmanship, Melee) in the game’s trailer, giving a glimpse into the combat-oriented options available to gamers. Regarding balance and styles of play, how do different configurations and options impact your level design and the subsequent goals for replayability? EL: Designing levels for Disjunction has been one of the most challenging parts of the development process. Disjunction is a game that you can play completely stealthily, without ever alerting a single enemy. It’s also a game where you can go in guns blazing and murder your way out of any situation. Because we offer these two very different approaches, we have to create levels that are both challenging and fun no matter what playstyle the player chooses. For us, it’s a balancing act between making sure that levels are fun and challenging to sneak through, while also being fun and challenging to shoot your way through. We hope that offering many ways to progress through levels will incentivize players to replay the game and try a different playstyle/character build. Replayabiliy is helped by the fact that the story changes pretty significantly based on the player’s playstyle. If the players kills every enemy they see, their narrative experiences will be very different than if they had killed no one. EM: Your Twitter includes things like revamped character portraits and gifs of security bots; would you say your work is driven by art and mood informing game mechanics, or do the mechanics come first with art and mood grafted on top? In the case of the security bots, did the idea for cameras to avoid spawn the droids, or did cool-looking droids spark the idea for a camera mechanic? EL: For us, mechanics almost always come first. We really wanted to create a game that could be a fun experience whether or not you cared about our story or art style. We spend a lot of time making sure that Disjunction handles well and has good game-feel, because at the end of the day, most people just want to play a fun video game, and everything else is ancillary. The security bots are actually a very good example of this. We knew we needed a variety of different enemies in Disjunction, and that it would be boring if every enemy were just a human with a forward-facing vision cone. We added in the bots as a way of letting us have different vision cones and enemy behaviors. It just so happens that robots fit well with our game’s setting and vibe! EM: You released an alpha demo of the game to give your audience a taste of the world, and I’m curious what the feedback has been like. In my experience, indie audiences are honest yet supportive, so what kinds of suggestions did you expect, and where has putting your work out there for consideration given you a few surprises? EL: The feedback has thankfully been very positive. We’ve received a lot of compliments on our gameplay, story, music, and art, while most of the criticism has been about minor issues like bugs or lack of quality-of-life features. I think your characterization of indie audiences is spot on – everyone is super supportive and even appreciative of things like public demos. We were expecting a generally positive response, but we were really surprised by how big of a response we ended up getting. It’s so hard to sift through all the indie games that come out these days, so we really thought that we’d get a handful of downloads at most. To say we’ve been pleasantly surprised would be an understatement! EM: I see a good many RPGs doing away with turn-based combat, which in general speeds things up and is a good thing; games like Death Trash (yet to be released) or Hyper Light Drifter provide brilliant examples of similar mechanics done well; when it comes to movement and action sequences, what do you hold as must do elements, and where do you see top-down 2d games exploring new territory? EL: Games like Hotline Miami and Enter the Gungeon are the gold standard for top-down combat. One thing that I think is very important is to always allow the player to have full freedom of movement. In Hotline Miami and Enter the Gungeon, the player is never rooted in place and is, in fact, encouraged to constantly keep moving to avoid enemy projectiles. This leads to super exciting and fast-paced action, but more importantly, it never makes the player feel like they’ve been cheated. There’s never an “unfair” scenario in either of those two games, the player has full view of every enemy and has all the necessary mechanics and movement allowance to avoid death, which prevents those games from feeling frustrating. We’re trying to have the same sort of thing in Disjunction. You’re never rooted in place, since you can melee or shoot while moving, and bullets are dodgeable if you’re at a far enough distance. In addition, since it’s possible to go through the whole game without even being seen, the player can’t feel cheated or hard done by a particular gunfight, since there always could have been an alternative solution. In terms of new territory, it’s kind of hard to say. We’re seeing games like Ruiner and The Hong Kong Massacre implement very fun bullet-time mechanics, but there’s nothing fundamentally new or innovative with the combat in those titles (which is fine). I think most top-down indie games will continue to refine what already works, with maybe a fun gimmick mechanic to make them a bit different. EM: Regarding the game’s woven narratives, what challenges come with presenting three characters for players to experience? Do you feel the need to ease the shift between protagonists? What other kinds of story and writerly elements help maintain a smooth, paced adventure? EL: It’s already tough enough to make players identify with one protagonist, so it’s been very hard to write three very different characters and have the player embody each one. There’s definitely a need to ease the shift between each character, so that players grow accustomed to each character’s personality, narrative, and game mechanics before switching characters. One thing that helps is that we take our time telling the story, and we try not to overload the player with too much information all at once. EM: As a small studio, I imagine it helps to be agile, so what does your decision-making process look like internally, and what have you had to do without? Where do you see the innovation of the project existing, and what has best helped you execute, given finite resources? EL: We’re a team of three brothers, so our decision-making process is probably unlike most other studios. We’re super honest with each other at all times, because there’s no fear of hurting any feelings or ruffling any feathers. Being a small team is great when it comes to making decisions because we can move very quickly. As soon as we all agree an idea is cool, we can immediately start implementing and testing it. Obviously, however, being a team of three has its drawbacks. We can only provide so much labor, no matter how hard we work, so corners are sometimes cut and features are occasionally omitted. The thing that has helped us execute our vision the most is the simple fact that we have a unified idea for what Disjunction should be. All three of us are on the same page and want to make the same game. Because of that, there have been very few wasted resources. Almost none of the game has had to be scrapped or fundamentally changed, since all three of us have a very clear picture for what the game should look like. They say not to go into business with your family, but I can’t imagine working with anyone else.